In the past celebrations of the Month of Overseas Filipinos, its themes were tackling on pressing issues affecting the rights and welfare of our migrants. This led to further awareness on certain issues, development of initiatives and strengthened implementation of policies and programs. This year, it is an opportune time for us to tap on the full potential of overseas Filipinos as culture bearers. Several fora are slated in the national, regional and international levels. The regional forum will be on 16 November 2016 (Wednesday) in Davao City. 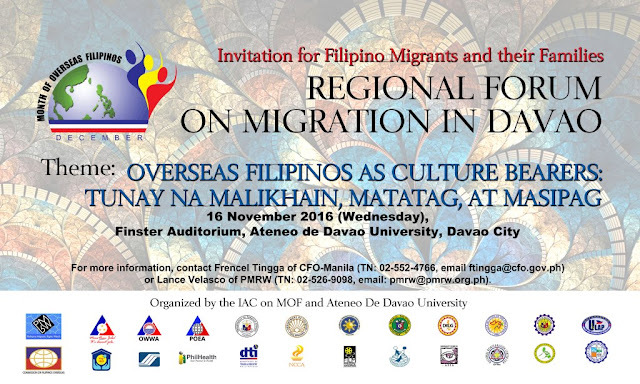 This forum is organized by the Inter-Agency Committee on the Month of Overseas Filipinos led by the Philippine Migrants Rights Watch (PMRW), the Commission on Filipinos Overseas (CFO) and the National Commission for Culture and the Arts. The Forum is supported by Pag-IBIG Fund and the Ateneo Migration Center. Film showing, courtesy of the Film Development Council of the Philippines, will follow right after the forum. For details, you may contact Frencel Tingga of the CFO at (02)552-4766, email: ftingga@cfo.gov.ph or Lance Velasco of the PMRW at (02)526-9098, email: pmrw@pmrw.org.ph.